Add wide range of vibrato to your tone with this board-friendly stomp. 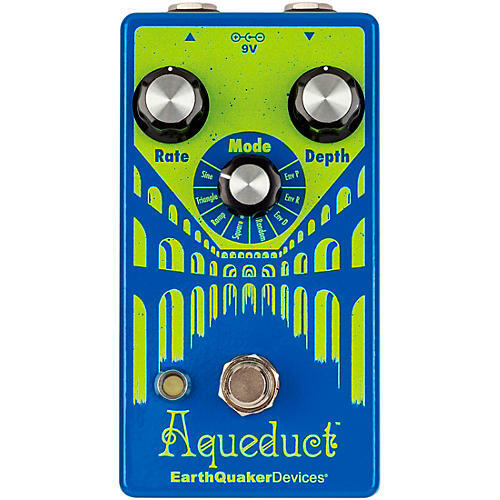 Aqueduct uses a short delay line with eight different modulation modes to deliver gentle rolling pitch-wobbles, steady kosmiche pulsations, rapid trills, slimy sonic squiggles, whammy bar wiggles, and anything else your pitch-warped brain can picture in your murky mind’s eye. Env P: This is Envelope-Controlled Pitch mode. If your instrument doesn’t have a tremolo bar, it does now. In this mode, the LFO is set to a sine waveshape, and frequency modulation is controlled by the dynamics of your pick attack and not the LFO. Do yourself a favor and try this one with Flexi-Switching. - Depth sets the wet/dry mix. This is the only mode that contains a wet/dry mix and may be set to taste to create touch-sensitive dynamic vibrato, chorus, flanger, or tactile pitch drops. Full counterclockwise is all dry, full clockwise is all wet. With this control set to noon you will get a 50/50 mix with a small amount of phase cancellation. - Rate sets the sensitivity and overall range of the pitch bend. When using any of the envelope modes, it's recommended placing the Aqueduct first in the signal chain and/or before any effects that increase volume or gain. The Aqueduct was designed for low to medium output pickups. Any increase in output will make the envelope settings more responsive at lower settings thus making them less dynamic. - For standard latching operation, tap the footswitch once to activate the effect and then tap again to bypass. - For momentary operation, hold the footswitch down for as long as you’d like to use the effect. Once you release the switch the effect will be bypassed.